It’s hard to come out and say it dear readers but I may have lied to you. Perhaps that’s too strong a word to use. Misled may be more apt. I’m so fly by night sometimes with my jam making, just throwing some fruit and sugar together and cooking it until I get fed up. Sure I might use a candy thermometer to try and hit the magic temperature I shared with you in my Strawberry Preserve recipe, but usually I get too fed up with my inaccurate thermometer or too impatient and just determine the set of the jam by looks. But our goal is to help you learn how to get predictable results. So if I over simplified hopefully this recipe will shed more light on how to make jam you can believe in. Another u-pick trip under our belts, although this one with a more manageable eight pounds of fruit, we returned home with pounds of fresh raspberries. I just learned that our county (Whatcom County) produces close to a third of all the raspberries sold in the United States. Pretty impressive stuff and makes me like it here even more. Orion helped us pick berries again although much less so than with strawberries. He primarily took the berries out of our containers and then wandered off and found his very first sprinkler to run through. 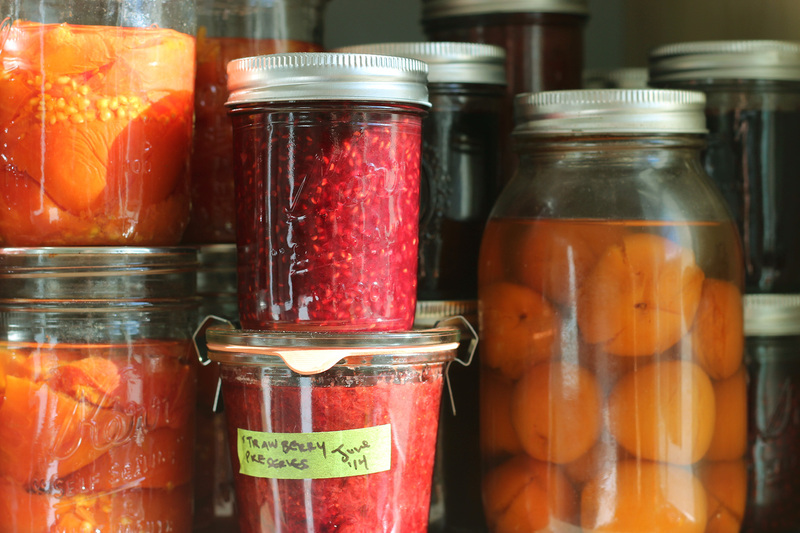 There’s something very satisfying in working all summer to put up your preserves for the winter. It feels like the ultimate way to take care of your family. And on cold, rainy days in the winter and gloomy spring, you’ll find me coming up with excuses to re-organize my preserves pantry, stacking and re-stacking jars of ruby-hued jams, large practical jars of tomatoes, and verdant jars of various pickles. Opening each jar of preserves is like stealing back to a moment or memory of summer. Remember how hot that one July was so that we stuck to the shade when we picked the berries and had to make the jam early in the morning before the house got too hot. And remember Orion running around with his barefoot toes in the grass, raspberry juice running down his chin so in love with summer and so entranced by berries. Aware of the claims I’d made last post about how simple the rule of “220” was in achieving the right set for a jam, I tried to make this jam for those who don’t have candy thermometers or who don’t trust them or get impatient waiting for your fruit to hit that magic temperature. I also tried a slightly different technique of letting the fruit sit overnight with sugar. I’d read that this technique can help pull out the natural juices translating into a shorter cooking time, which in theory will preserve more of the fruit’s flavor. I have to say though that while that technique might make sense for juicier fruits like strawberries, peaches, or plums, its results seemed negligible for raspberries which don’t put off that much juice to begin with. So I’ve further adapted the recipe below, with the good news being that it’s dead simple. I stuck entirely this time around to what I’ll dub the “Spatula Test.” Grand name, I know. It probably needs to be workshopped and re-marketed but once you try it and it works for you, you’ll love it as much as I do. This is cooking at its most intuitive. You simply keep stirring your jam every few minutes and then at the end of your stir, pick up your spatula or spoon and watch how the jam runs off it. Most of the time you’re running this test it will pour off your spatula in a rush of individual drips. But as soon as your jam sets, once you perform this test, your jam will start to pour off in a more steady stream looking more like syrup than rain. If you want to be more certain, you can see if once you pour the jam off the end of your spatula, if some of it remains on the back of the spatula in a thin coating. It sounds complicated but it’s a good chance to practice your cooking instincts. And it’s more readable than it sounds. This was the first time in years of making jam that I truly could confidently say, “Pauline, I think your jam has set,” instead of reading the thermometer and mumbling “Well, I guess that’s done then.” You’ll have to trust me and give it a try yourself and let me know how it goes. I hope we can continue to learn how to make better jam together. Plus once you can read the changing texture of liquids, we’ll be able to work on fruit curds, better understand how to know when whipped cream is finished, and make some of my favorite custard-based desserts like panna cotta. 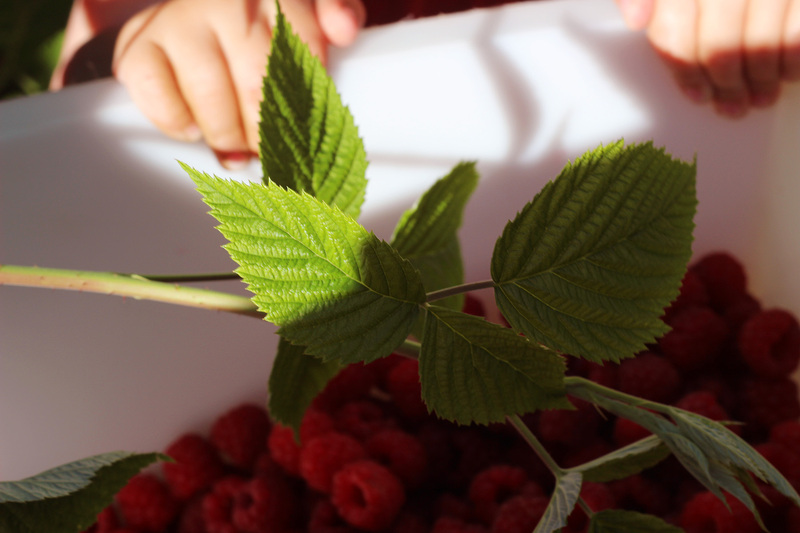 Raspberries are much more delicate than most other fruits so the less you handle them the better. I’ve even read recipes that recommend not washing them at all. Just take care and use a light hand. See earlier posts like Strawberry Jam for tips and tricks on what tools are useful to have on hand and how to sterilize jars. “Set” is a term used to describe jam’s texture. When a jam has “set” it’s achieved the perfect in-between state – not too liquid to run off your toast or make you curse under your breath at your feeble results but not so thick that you have to dig it out of the jar with a knife. It’s a chemistry balancing act between the sugars, acid, and pectin in the fruit. This set point will vary based on the type of fruit (some have naturally higher levels of pectin than others), its levels of pectin, what the weather is like that day, your canning pot, and greater forces at work that ensure that it’s near impossible to get the same results every time you make a recipe. See the last paragraph of the post above for an overview of how to use the “Spatula Test” to test the set of your jam. You can use a thin-meshed metal sieve to screen out the seeds from your jam. There’s many schools of thoughts on this and it really comes down to personal preference and patience. It can take a lot of work to separate out all the seeds from the fruit. I tend to filter out about half of the jam so that I’ve reduced somewhat the grit in your teeth factor while still preserving the classic look and feel of raspberry jam. Just be aware that if you filter out more or less of the jam, it will affect your yield so throw in some extra pint jars if you’re not planning on removing any seeds. A dead simple recipe perfect for those just starting out. 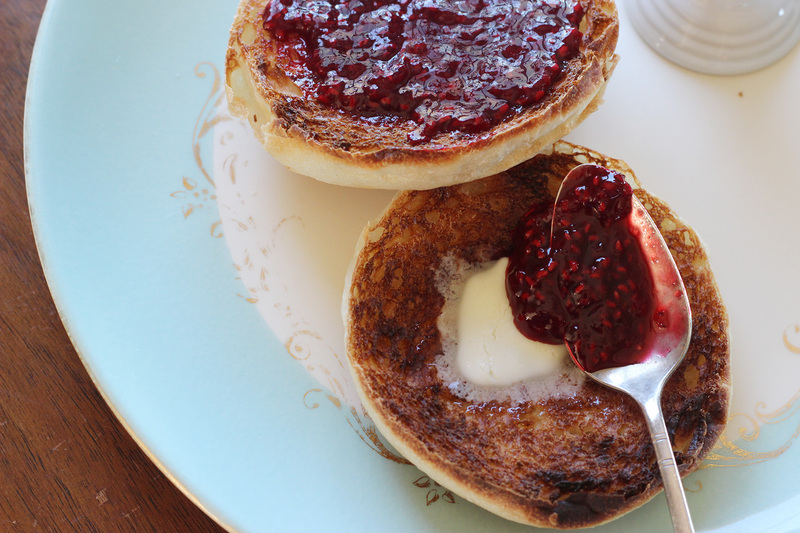 Raspberry jam is my absolute favorite and if you make this now you can spread it all summer long on little bites of burnt toast or even slather it between dense linzer cookies come winter. Feel free to leave in all the seeds or strain out all of them, just expect a slightly different yield. 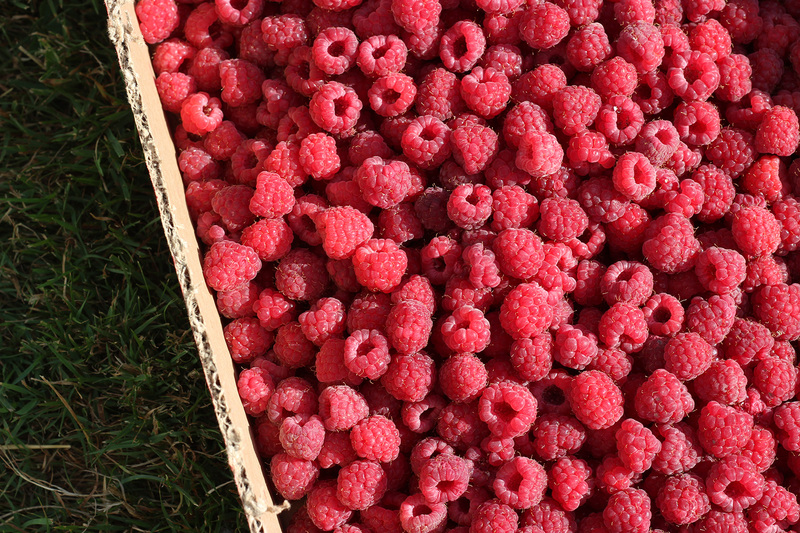 Prep the raspberries, sorting through them to remove any fruit with mold and take off any lingering leaves and stems if you picked the berries yourself. Delicately measure them and transfer them to a colander to rinse lightly with water. 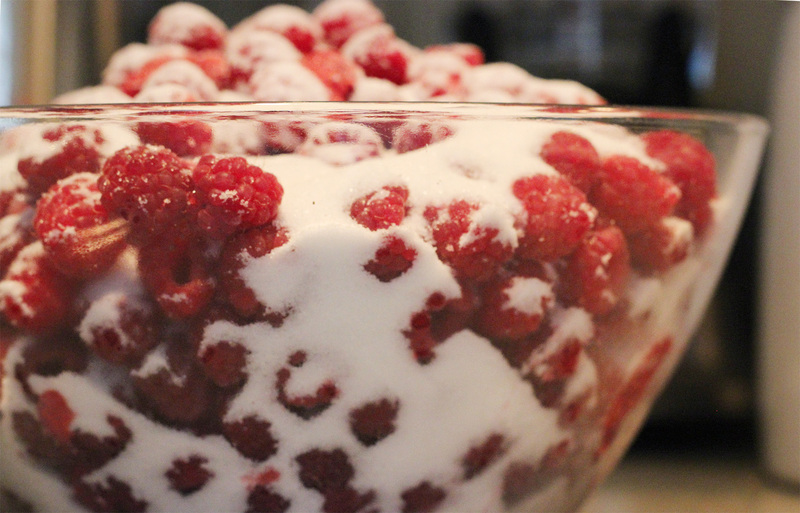 Place the raspberries in a thick bottomed-pan with high sides and add the sugar and lemon juice. Bring to a simmer over medium high heat. Place pint jars in a large sauce pot and cover with an inch of water. Bring to a boil to sterilize. You want to boil the jars for roughly 5 – 10 minutes to clean. Then turn off the heat and leave covered with a lid. Once the berries have broken down and are simmered in juice, take a fine-mesh sieve and place over a liquid measuring cup. You can also do this directly over the pan but it’s more tiring that way. While the jam continues to cook, spoon out several spoonfuls at a time and press to extract the liquid, leaving behind the seeds. Continue this process until you’ve removed seeds from roughly half the jam. Continue to cook over medium-high heat for 20 – 30 minutes (or however long it takes to successfully perform the Spatula Test described above in the post). Stir every few minutes to ensure no fruit is sticking to the bottom of your pot. Once the jam appears to have achieved its set, take it off heat and let it sit for a minute while you prep the jars. Lay out several kitchen towels and remove the sanitized jars from the pot with canning tongs or regular kitchen tongs. Place them upside down until you’re ready to use them to minimize bacteria getting inside them. Meanwhile throw the jar lids in the hot water and turn the heat back on to high so that the water starts to heat again. You don’t want to boil the lids though, as that may compromise their seal, so work quickly. Using a large spoon, skim as much foam as possible off the top of the jam. Using a canning funnel with a wider mouth and a large spoon or ladle, spoon jam into each jar. Fill each jar to a quarter of an inch from the top and then immediately screw on the sterilized lid. Using tongs, place the jars back in the water bath and make sure they’re still covered with an inch of hot water. Bring to a boil and process for 5 minutes at a full rolling boil. Then remove and leave to rest over night on a kitchen towel. Check on the seal of the lids by pressing the top of each jar. If you can push down the center of the lid, then you haven’t properly sealed the jar. Any jars with unsealed lids can be kept in the freezer or refrigerator but should be used in a few weeks time. The jam in sealed jars will keep for months in a cool dark location like your pantry.